Currently viewing the category: "PDFs"
Co-hosts Larry Pinkney and Phil Restino with guest Ralph Poynter on We Cannot Be Silent radio program, Wolf Spirit Radio, April 15, 2013. Caller Janet joins the conversation in the second hour. Theme: Lynne Stewart and Political Prisoners in the U.S.
On November 18, 2012, Black Activist Writers Guild saved a page in PDF format from www.at1ce.org (2011-2013, Germany) titled ‘American activists.’ The PDF contains 1500 of the 5173 (past and contemporary) ’American activists’ entries of which Larry Pinkney is number 131. 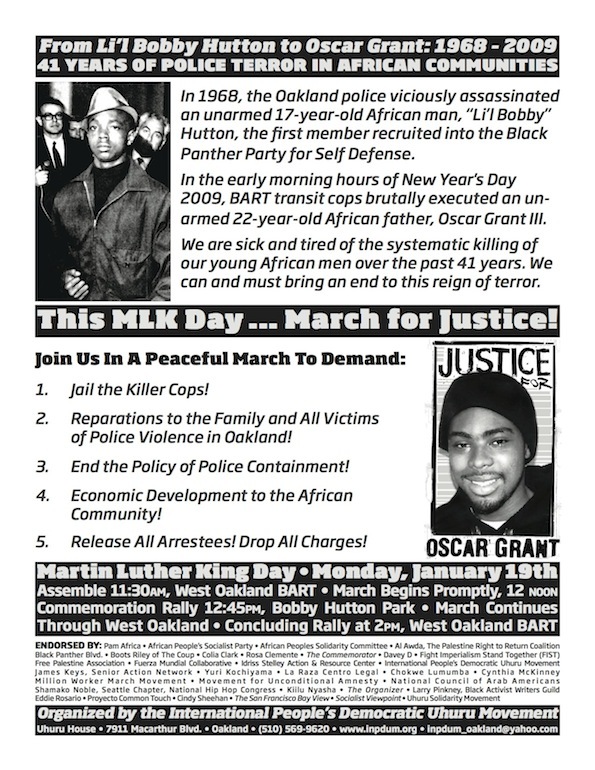 Poster of a January 19, 2009 commemoration and march for justice in Oakland, California (PDF) of which Larry Pinkney of Black Activist Writers Guild was an endorser. DIE PRÄSIDENTSCHAFT OBAMAS: DAS GLEICHE WIE BISHER, NUR NOCH SCHLIMMER! Larry Pinkney’s November 28, 2005 letter to KPFA Program Council members (Berkeley, CA) was published in indybay.org on November 29, 2005. Larry Pinkney is listed as a Program for Individualized Learning (formerly University Without Walls) graduate candidate in the University College, University of Minnesota, Commencement program of June 3, 1989. The degree to be conferred to Larry Pinkney is listed as a BA in International Relations.